The three-prong brake light switches in the later cars have had a rather high failure rate. We are replacing them as they are needed. If yours requires excessive pressure to actuate the lights, e-mail me for an update package. You can also do it yourself aquiring a Cole Hersee switch 8626 (Equivalents: Ford 100810B, GM 403936, Wagner FC5106) and installing it by following the instructions below. *After the new switch is installed, the brake warning light on the dash (if you had one) will no longer work. 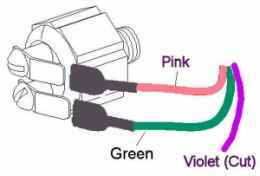 If you have a switch in each master cylinder, you only need to replace one switch. Do not remove the second switch! Remove the brake master cylinder cover. 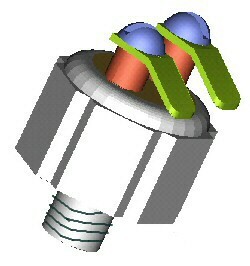 Remove the electrical plugs at the rear end of the cylinders. Have the new switch ready to install, complete with a small amount of low-strength sealant like blue Locktite on the threads. Remove the outside switch with a socket or box wrench. Quickly replace it with the new switch – but leave it loose. Let fluid seep from the connection for the time necessary for 20 or so drops to leak. If you have a helper, have them push on the pedal lightly. Tighten the new switch to 12 lbft. Dry the threads around the switch. Let the car sit for at least one hour before you apply brake pressure. 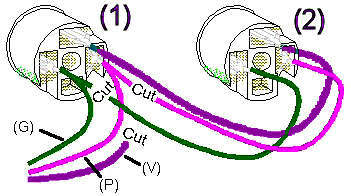 If you have two brake switch sockets, cut the three wires as shown at the right. Tape the violet wire completely where it comes out of the harness. It's no longer needed. Trim the “stubs” of the other two wires close to where they join together. Use a small jeweler’s screwdriver to remove the green and pink wire terminals from the remaining socket. Push the flat blade into the small slot adjacent to the blade. It will flatten a retaining tab so that the terminal can be removed. Alternately, if you have a good crimper, you can cut the wires and put on a new terminal end. Cover the bare terminals with the included shrink tubing and shrink with a heat gun or match. Attach the male tabs to the switch posts with the screws included. Connect the wires as shown (although they can be reversed without a problem). Press hard on the brake pedal and check for leaks at the threads.